This past September, we all watched in horror as tens of thousands of individuals were evacuated from Louisiana, Mississippi, and Alabama to emergency shelters throughout the country. Even as a flood of aid and assistance poured into these areas, volunteers cited the lack of communications and technology as one of the largest obstacles in their relief efforts. Within days of the disaster, however, community technology centers (CTCs) showed that they were willing and able to provide emergency communications access and assistance to those displaced by the storm. 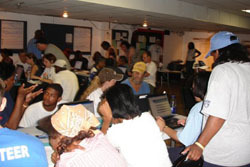 Thanks to CTCs set up in emergency shelters and existing CTC staff and volunteers who made themselves available to survivors in relocation areas, thousands of survivors registered themselves in online directories, searched for news of friends and loved ones, signed up for government assistance and kept themselves informed of developments in the rebuilding efforts. Essential government services, including those provided by FEMA and the Red Cross, were overwhelmed in the early days and hours of the response. In many cases these services were accessible to Katrina survivors only through online forms, as traditional phone-based communications were constantly busy. Online applications for relief required both access to and the ability to use technology. Many of the displaced lacked this access and knowledge before Katrina hit, and therefore faced significant barriers. Because CTC staff routinely aid individuals with little or no experience using technology, they were well-poised to help evacuees. The experiences of several CTCs also demonstrate that relocated evacuees found it extremely valuable to be able to search for jobs, find a place to live, and prepare a resume – all part of returning a sense of control and normalcy to their lives. In the Astrodome in Houston, for example, staff and volunteers from Technology for All created a CTC for evacuees that served, at peak operations, over 1,000 survivors per day in their two larger computer labs. They also created an online journal, or blog, documenting their experiences and lessons at http://texasctcs.blogspot.com/. Boat People SOS in Houston provided technology and language support for the displaced Vietnamese-American community. Also in Texas, TechCorps, in collaboration with Houston IT Empowerment Consortium (HITEC) and Bridging the Digital Divide, created two CTCs in Houston’s George R. Brown Convention Center that registered at least 3,000 survivors with FEMA with the help of ten full-time staff and approximately 300 volunteers. Elsewhere, the Ohio Community Computing Network created a CTC at the Ohio Air National Guard base in Columbus to serve relocated evacuees, and Cleveland Digital Vision led an effort to provide a CTC to evacuees at the Cleveland Convention Center. In these and many more efforts, CTCs took leading roles responding to their communities’ needs in the face of Katrina’s devastation. CTCs across the U.S. can learn from these early efforts and take steps to help those who resettle in their communities as well as plan for future emergencies. While emergency preparedness is in the national spotlight, CTCs should take the opportunity to better educate and inform their local government agencies and area relief organizations of the valuable roles that CTCs serve in their community. Too many local governments don’t know enough about the work of area CTCs or their potential to aid in emergencies. Local officials could also be aware of Katrina evacuees relocated in the community who could benefit from CTC programs, and could assist CTCs with outreach efforts. To better prepare for future emergencies, CTCs can become active in emergency planning by meeting with emergency services providers in their communities and reviewing local disaster response plans. CTCs can serve a central role in identifying and meeting the needs of local citizens. Also, by creating a response plan and pre-arranging resources, CTCs can better prepare to function following a natural disaster or local emergency. Simple and effective plans might include a drive to register and train volunteers with basic emergency communications (how to get and use email and fill out online forms, for example) and preparations for rapidly alerting and mobilizing those volunteers in a time of need. Additionally, CTCs might want to contact area businesses and foundations to develop plans for coordinated technology and financial assistance. Community Technology Centers’ Network (CTCNet) is taking an active role in the disaster response by sharing information, gathering lessons learned, and pursuing contacts with the Red Cross, government agencies, and corporate sponsors in order to provide resources to CTCs that have directly supported relocated survivors. In addition, we have proposed hosting national and regional summits on emergency citizen communications focusing on more effective coordination between CTCs and emergency planners, as well as creating a guide using lessons learned from Katrina to help prepare CTCs to respond to future national emergencies. CTCNet is also working to ensure that ongoing responses to provide support to Katrina survivors are connected to existing CTC efforts. Making this connection will ensure that – rather than fading away when the immediate relief effort is finished – the resources being marshaled to address these problems on an emergency basis will result in stronger sustainable services. For many reasons, natural disasters tend to disproportionately affect the poor. During the Katrina aftermath, national news coverage exposed flaws in our society that present huge challenges to reconnecting the displaced communities. In the months ahead, many CTCs will carry an extra burden as they take on the added responsibility of assisting displaced populations with vital services. CTCs will also have an opportunity, however, to demonstrate their strength as community providers and serve as effective advocates in policy discussions. Speaking about the devastation of Hurricane Camille in Biloxi in 1969, former governor of Mississippi, William Winter, said that the number of nonprofit organizations that responded could be counted on one hand. Extraordinary growth in the nonprofit sector since that time now provides a remarkable opportunity for CTCs and community organizations to build stronger connections and to be a voice for constructive changes in the policies and systems that will shape the rebuilding and recovery of our communities. CTCs will also have an opportunity to demonstrate their strength as community providers and serve as effective advocates in policy discussions. The services CTCs have been providing for survivors – and those they plan to provide over the longer-term – are directly in line with their missions. CTCs have worked for more than 20 years to ensure that everyone can realize the benefits of technology in a society in which technology skills are necessary for lifelong learning, jobs, health, community and economic development, and meeting neighborhood needs. CTCs offer opportunities for government, businesses, and neighborhoods to create hope for the survivors’ future, contribute to rebuilding lives, and continue to do what they do best: use technology to meet human needs. Though there is a wide array of necessary relief efforts being considered throughout the Gulf States, CTCNet intends to continue working to ensure that CTCs will continue to be prominent and successful in these efforts. Matthew Walker is a CTC VISTA serving as Member Services Associate at CTCNet.